Saturday I had a day off so explored more of Downtown Seattle. I started by catching the monorail from downtown Seattle to the Seattle Centre. A nice quick ride. 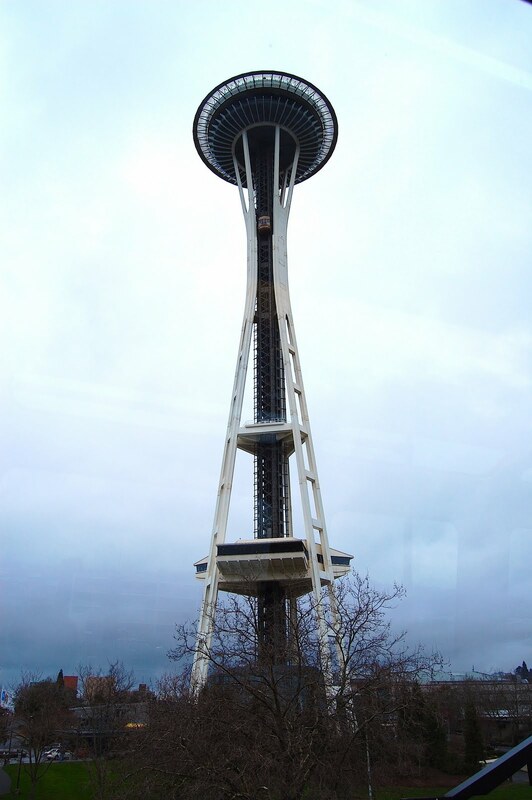 From there I ascended the 520 feet at 10 mph in the lift, sorry elevator, to the 360° observation deck of the Space Needle. Despite an overcast day the views of the city were still quite stunning. The structure of the building is pretty impressive too, and it is hard to believe it was constructed in the 1960’s. I had a coffee (there’s a surprise) while I looked out across the city. As well as taking lots of photos, I also walked around with the flip video and you can watch that here if interested. Looking at the patterns and variation of the city caused me to reflect upon more of whay I am here and how varied, yet ordered God is. You can tell from the video and photos that Seattle is a fairly varied city. There is Pike Place market, the area around the Space Needle, the water, the skyscrapers, the low apartment blocks, industrial areas, dock areas …. I could continue to list. It’s very diverse and yet it is all Seattle. Like wise, you can’t point to the Space Needle and say ‘that is Seattle’. As much as I, and many others love Pike Place Market, you can’t point to it and say ‘that is Seattle’. You might like the waterfront, but again you can’t point to it and say ‘that is Seattle’. Seattle isd a collection of them all. Without one part, something of the character of Seattle would be lost. To get an understanding of Seattle I need to visit a variety of areas. I am told to get the best understanding of Seattle I need to go on the underground tour. This shows the original Seattle that has been built on top of. To understand Seattle, I would need to look underground to learn something of its history. In many ways this is similar to how we can grow in understanding of our faith in God. Our different interpretations of scripture or prayer are as varied as the buildings and neighbourhoods of Seattle. To understand more we need to observe and listen to all areas. To gain greater understanding of God we need to go underground with him, and explore the past roads of faith. As we do this we need to realie that we will never come to a full understanding of God! Sermon over! After all this reflection I soent money on gifts for the family to take home and then I met up with Ned to listen to some music in the 15th Avenue Coffee and Tea House – (just look at all these coffees they offer! )a pretty cool end to the day! This entry was posted in coffee, COTA, seattle, theology by robryan65. Bookmark the permalink.